The new feature makes it easy to loop people in for a video conference. 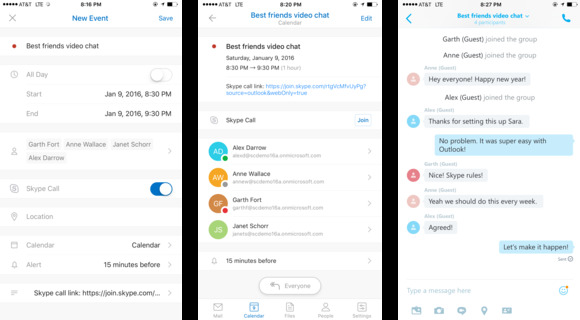 Outlook users who need to cook up a video conference will have an easier time with new updates Microsoft announced for the app on iOS and Android. The updates, which are rolling out today, let users tap a Skype call toggle inside the app's event creation screen, which will automatically generate a link to a video conference for invitees. When the time comes, people who are supposed to participate just need to tap on the Skype link, and the video chat app will open up on their devices. For those people who don't have a Skype app installed, Microsoft's recently-released Skype for Web will let them join in on the call, even if they don't have Skype accounts. Android users got a little extra love with this update, which gives them a quick navigation bar at the bottom of the app that lets them quickly navigate between the different mail, contacts, calendar and files tabs inside the app.